"if ever the stones turned up again I could identify them". There is a belief that Lasseter commonly salted gold mines, but apart from a prank with brass bolts and filings while working in Canberra, there is no evidence that Lasseter committed this fairly widespread fraud. Cutlack salted his 'Lasseter's Reef' and Blakeley salted Lasseter's specimens. Prior to 1929 Lasseter lacked opportunity, and probably the means, to indulge in mining fraud or share speculation, and did little if any practical prospecting or mining himself, although from a gold mining background. As Lasseter's biographer notes, the 1929 letters to Texas Green and the West Australian Minister for Mines were indeed, "out of the blue". Blakeley salted Lasseter's gold specimens on 31/08/30 while Lasseter was absent on his short walk to the south, in this case Blakeley's methods and motives were different from the usual and were not fraudulent and probably appropriate. At this stage of the expedition Blakeley was convinced that Lasseter was a fraud and took steps to prevent the specimens from being used for such a purpose again. He borrowed Taylor's drill and bored a hole in each stone and filled the hole up with white metal and concealed the hole with glue, his reason being to identify the specimens if they turned up in the future. Lasseter's only known attempt at 'salting' was in the form of a practical joke played on fellow workers in Canberra in 1927. 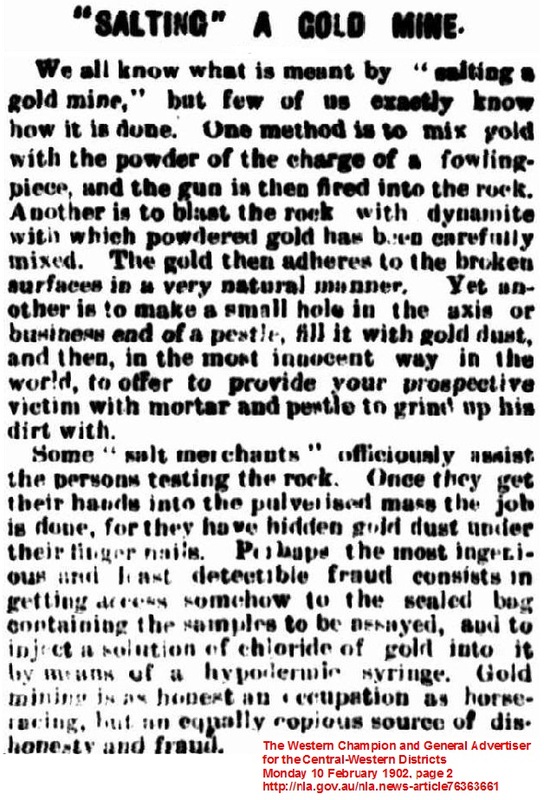 A Mr. Jenkins recalls Lassiter (sic) salting a creek at the base of Mount Ainslie with fragments of brass bolts and then showing a friend the gold find and asking him to keep it secret, as Lasseter probably anticipated very few gold finds are kept secret and, "gold fossicking was on, until one man found a piece of gold with the thread on it !". Blakeley Fred Dream Millions 105. Hubbard Murray The Search for Harold Lasseter 98.